When it comes to getting plastic surgery in Korea, wouldn’t it be nice if financial burdens were one of the least of your worries? 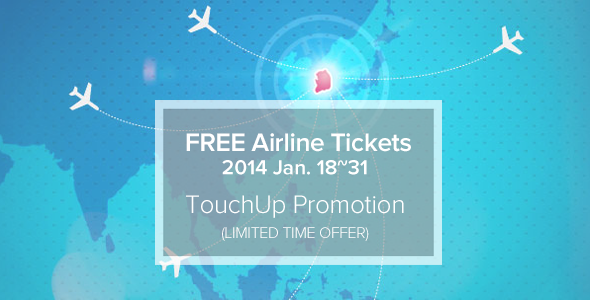 This January, Seoul TouchUp is giving away FREE airline tickets! No, not 25% or 50% off but FREE tickets. You heard me right. This special offer ends by 31st January, 2014 ! So, how can you stand a chance to win a FREE airline ticket? Click Here to learn how to get Free airline tickets (only 1:00 min). 2. Get involved with our online community by Liking us on Facebook, or join our Google Plus circle! 3. Write an insightful comment in one of our blogs – Psst! The more popular your post is, the higher your chances are! 4. Complete our Survey telling us what YOU’D like to see on our website. 5. Send us a clinic review over at our TouchUp members’ Lounge.